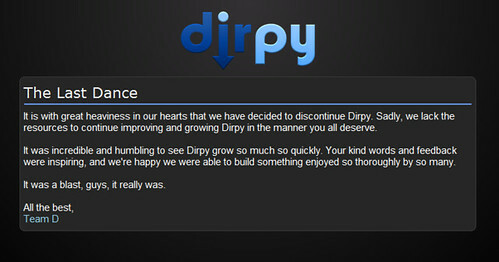 I first heard about Dirpy this past summer from one of my favorite geeky tech sites, Geek Sugar. The service allowed users to convert the sound from You-Tube videos into mp3 files that you could import into iTunes and even upload to your iPod or other music player. I only used the service a few times, but it was an awesome resource. This past week, the service was shut down. The front page was replaced with a note that the creators had decided to discontinue. The discontinuation reminds me of what happened to Ruckus a few years ago. Ruckus was a subscription site that offered free music downloads for college students. It only provided WMA files, but of course we all had our way around that limitation. It too was suddenly discontinued one day, with the homepage replaced with a note about the discontinuation and a thank you to those who had helped to support the site. Good thing there are a lot of similar services out there, as well as several Mozilla add-ons. I just really liked the way that Dirpy was organized. Add. : If you used Dirpy and are looking for something to fill the void, here's some sites that provide the same service.